The well-loved line about items in our homes was the first William Morris quote we came across. Both as people with objects and as makers of objects, we feel passionate about this idea. But freeing our lives of clutter by surrounding ourselves with beauty and usefulness is just part of it. Useful items themselves can and even should be beautiful. And beauty, with its ability to raise our spirits and our expectations, should be an every day part of everyone's life. It's remarkable how relevant and contemporary the writings of Morris, a 19th century textile designer and a founder of the English Arts & Crafts Movement, remain today. Many of the lines we love touch on our deepest values as artists and members of the broader community. Beauty, art, happiness, personhood, even the environment and the natural world. Nearly 150 years later, despite all the changes of the intervening years, these things remain at the heart of our lives. A few shots from a recent trip to the Virginia Museum of Fine Arts. We are so lucky to share the same home city as this fantastic resource. There is nothing like being surrounded by art, lots of truly great art, in person. While we access art online every day, the visceral experience of seeing and being with the original work is a different, deeper experience, one that refreshes and inspires us. These photos are detail shots of a late 2nd century Roman mosaic, The Four Seasons, a floor mosaic from none other than the House of the Drinking Contest, made from stone and glass. We can't help but insert a plug for mosaics here: this piece is a great example of the physical durability and the lasting power of color in mosaics. To kick off our Inspiration series of posts about artists we admire and other sources of inspiration in our work, it only made sense to start with Catalan artist and architect Antoni Gaudí. 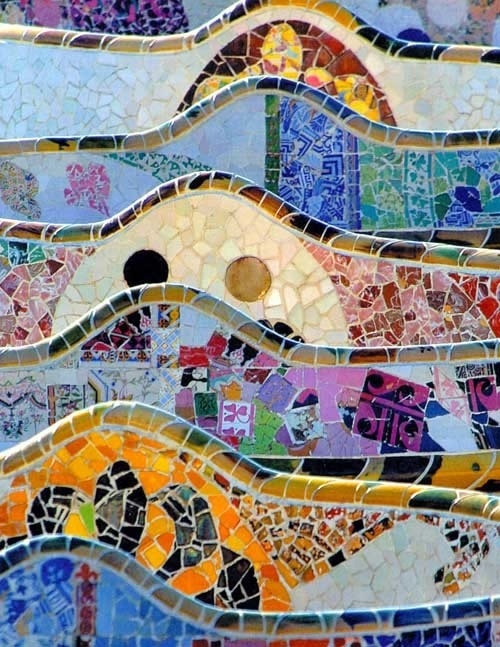 There is so much that we admire about Gaudí. Of course his beautiful work, among the most loved in the world. Seven of his works are Unesco World Heritage sites, including all the work pictured here. He shared our love of nature and allowed that inspiration to speak through his work. His masterpiece, the as-yet-incomplete Sagrada Familia, is a fascinating and stunning study in the architecture of nature. Most personally, we are drawn to Gaudí as a craftsperson trained in many fields, including those closest to our hearts, blacksmithing, ceramics, and stained glass.